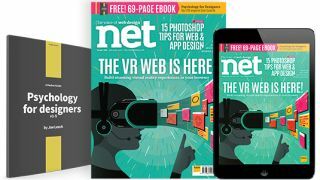 Explore browser-based VR, get the low-down on web typography and steal performance secrets from the BBC in net issue #288. Welcome to the new world: the VR web is finally here. This month, Liv Erickson plunged head-first into the world of browser-based virtual reality and the tools and frameworks that are making it more accessible than ever before. In the latest issue she shares her findings. This month’s freebie is a 69-page ebook on Psychology for Designers. In it, you’ll discover different types of psychology, and how to use psychological insights to solve design problems. In the Projects section, Zell Liew reveals the rules of web typography, from mastering typesetting and vertical rhythm, to making sure your type scales properly, to getting your designers and developers to play nicely together to build a typographical triumph. It’s an indispensable guide for anyone working with type on the web. Also in the Projects section, Matthew Clark reveals how the BBC handles performance. As the site that delivered seamless Olympics coverage to over 100 million devices last summer, they have a thing or two to teach us.